This post will show you that I am improving big time in my eye makeup looks. I am damn proud of this one and I hope you guys like it. Work is getting more bizarre by the minute. Annoying is still at large and in charge (in her own mind) but I'm being told that when the boss is asked directly, she is "just a clinic nurse." But then I'm told she meets with the boss every day at 4pm. What this tells me, is that the boss likes what she is doing even if the rest of the place thinks she's annoying as f*ck. True story. One of the doctors called on Friday to ask if we found her as annoying as they did. Think that's a unanimous resounding yes on our parts. I have been avoiding the boss and my meeting. I know I'm going to cry and it's just not something I'm looking forward to and I fear my false lashes will fall off. What happens when you cry with falsies on? Seriously people. I need to know! Went to the eye doctor for my yearly exam. Luckily, I don't need new glasses this year. Anywho, I was wearing my lashes but sort of figured they'd be in the way when you squish your face to the puff in your eye thing. Is it just me or is that the most irritating test ever? So before she got started, I looked at her and said hold up, I need to take off my lashes. I ripped them off, put them in their little case and proceeded with the squish face test. She looked at me after and said I look way different without lashes on. Dude do I know that! Now that I've been wearing them, I just can't take looking at myself without them on! She also asked me how long I'd been wearing them. I looked at her and said "about a month." HEHEHEH. Oh and remember that funky lash tool thing I showed you in my lash post? Totally amazing invention. It has helped me beyond measure to get my lashes on. Am I still having trouble getting them in the right place? Yes at times, but I can at least get them on much faster and easier. Maybe I should have bought more than one??? Now as I told you before, today's eye look makes up for the horrid yellow look a couple posts back. I took my time, blended like a fiend and got good pictures. 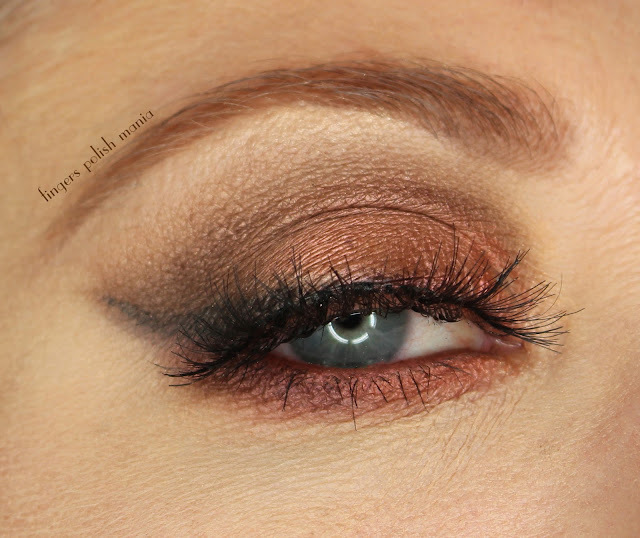 Here is my Fall 2015 Bronze Eye Look. Yes it deserves capital letters! Obviously this is an open eye, half closed and closed lids. I used all Makeup Geek eyeshadows. Peach Smoothie, Homecoming, Brown Sugar, Bada Bing, Roulette and Burlesque. For Instagram, I did a collage. I did a winged liner and used Bada Bing to smoke it out as I didn't want it too precise. I am very proud of this one and I hope you like it too!